This was my first climbing logbook. Unfortunately it is not complete, as the first seven pages have been torn out (presumably by myself – probably because they contained details of tree climbing and buildering that I later found embarrassing.) Also, I have omitted some early southern sandstone climbing between autumn 1967 and spring 1968. After 1968 I started a much smaller, more concise logbook (without diagrams! ), and then again, in 1972, a series of even more concise books that I used until the mid-1990s, after which it lapsed, sadly. I may eventually add these later logbooks to this website. Of course, in retrospect I am absolutely delighted that I kept this very early detailed logbook. 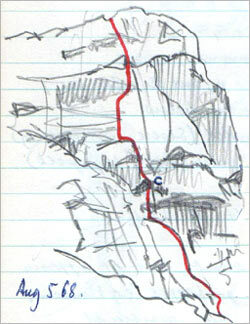 The great ‘summer of 68’ section, which I wrote up immediately after our return from Snowdonia in early September 1968, shows very clearly the youthful enthusiasm of an 18-year old who has become completely besotted by climbing and fascinated by the rock features in which the routes are embedded. For my (nearly complete*) climbing logbook, see my UKClimbing.com logbook. *1998 to present day still to be added.